What KPI’s do Sales Managers need to Track? Key Performance Indicators aren't new, but for many sales managers KPI's aren't defined, tracked or used as pointers to help them manage salespeople. Maybe it is the lack of easy to use tools to track KPIs. Maybe it is the sales manager's inability to understand how they can use KPIs to look at the past and predict the future; regardless, the excuses aren't valid anymore. 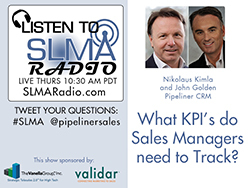 In this interview with Pipeliner CEO Nikoluas Kimla and John Golden, Chief Strategy officer for Pipeliner, they discuss the five KPIs that every sales manager should use to understand how to coach their teams to extraordinary success. The host is SLMA's Jim Obermayer. Nikolaus is a true entrepreneur: over the last 40 years he has created six businesses, three of which are still going strong today. His experience in the software industry goes back over 20 years to his founding of uptime ITechnology. Through his work at uptime he learned software development from the ground up and, as noted above, the company has been a resounding success. Following the project of World Check (World Check was acquired by Thomson Reuters 2011), which uptime has completed developed and overseen the IT for more than 10 years and still working today on it, Nikolaus' attention turned to sales—for he felt that salespeople were seriously undervalued and unsupported in today's business world. Thus began the 8-year journey that ultimately resulted in Pipeliner CRM—a unique solution that actually empowers salespeople to sell instead of burdening them with cumbersome administrative duties as traditional CRM solutions have. "Technology is nothing. What's important is that you have a faith in people, that they're basically good and smart, and if you give them tools, they'll do wonderful things with them." Provides strategic direction to Pipeliner sales to increase market penetration through effective direct and channel sales strategies while ensuring that the organization is aligned with its target buyers, and that the platform continues to deliver optimum value to sales people, sales managers and business executives.